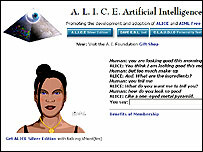 A computer chat program called Alice has won a prestigious prize for human-like conversation for the third time. It was judged to be chattiest bot out of the four finalists in the Loebner Prize for artificial intelligence held in New York on Sunday. British hopeful, Jabberwacky, came second in the annual competition. The event is based on the Turing Test, which suggests computers could be seen as intelligent if their chat was indistinguishable from those of humans. Alice won the international competition for the most convincing entry in 2000 and 2001. 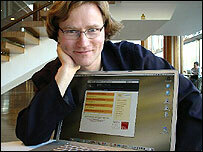 Its creator, American Richard Wallace, started work on the software in 1995. Since then, he has been refining the conversational skills of the software through the Alice Foundation. Alice works by following a complex set of rules that govern its responses to a question. It managed to see off three other contenders to take the bronze award in the Loebner Prize for a third time, convincing judges with its life-like responses. The British contender, Jabberwacky by Rollo Carpenter, had to settle for second place. "I'm disappointed as I did believe I would win," Mr Carpenter told BBC News Online. However, he remained hopeful that his program would be more successful in the years to come. "Alice is based around a set of big and complex 'if statements' that analyses the text and respond to the one thing that you have immediately said. "My program is more open and free," he said. "I believe the day of the learning AI will come soon. It is inevitable because a hand-coded system cannot keep up with an exponentially growing system which learns dynamically." The Loebner Prize was started in 1990. It hands medals and cash prizes to the inventors of computer programs that can maintain the most life-like dialogue. The competition is a variant of a stricter test first thought up by pioneering mathematician Alan Turing. He suggested that computers could be said to be intelligent if their responses to conversational cues were indistinguishable from those of humans. The contest in New York was hosted by American philanthropist Dr Hugh Loebner, who started the prize in 1990. The Gold Medal, and a cash prize of $100,000 (£69,000), is awarded to the program that convinces half the judges that they are talking to a believable virtual person on screen. The Silver Medal, plus a cash prize of $25,000 (£17,000), goes to the text-based program that convinces half the judges. No Gold or Silver medals have ever been awarded. But every year, a bronze medal, and $2,000 (£1,400) cash, goes to the most convincing entry.